To See TV On DVD"G,H"
With a title like 'Guess Who's Coming to Christmas' I thought this would be a riff on the classic 'Guess who's coming to dinner.' How wrong was I. Instead it is one of these faith based films for the family with one horrible subtext which urinates all over the message from the Sidney Poitier/Katharine Hepburn/Spencer Tracy classic. Wild rock star Dax (Drew Lachey) is found by drunk in his car by the press. 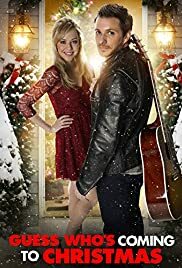 With a potential public relations disaster looming his manager sends him off in Cedar Grove, a small Midwestern town where he will spend a week with Reverend Harding and his family and perform in a local Christmas concert. In short he is to fulfil a child's 'Dear Santa' Christmas wish and repair his image. However Reverend Harding has strict rules such as no drinking and a curfew. Dax becomes charmed by his family and friendly with his daughter who was a fan of Dax's music. There are hiccups along the way Dax breaks into the Reverend's liquor cabinet and drops down drunk at church. Still Dax comes to appreciate the kindness of the family and gets into the festive spirit and cleans up his act. Dax decides to dump his Asian girlfriend because she cannot keep him out of trouble, probably not Christian and foreign and in a Christian based film that is certainly not on.